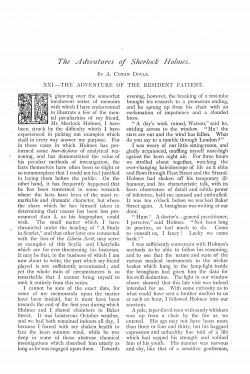 The Adventure of the Resident Patient (RESI) is a short story written by Arthur Conan Doyle first published in The Strand Magazine in august 1893. This is the 23rd Sherlock Holmes story. Collected in The Memoirs of Sherlock Holmes. I stared at him in astonishment. Helped him to a chair. He burst into my consulting-room. In his hand he held a pistol. 'You have got them!' we cried. "I was shocked to see he was staring at me with a perfectly blank face." 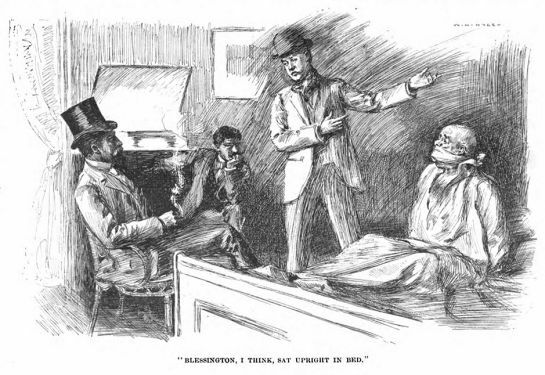 "Blessington, I think, sat upright in bed." I made notes of my patient's pulse and temperature. The maid found the unfortunate fellow hanging in the middle of the room. It ended by their taking Blessington and hanging him. 1985 : The Resident Patient (UK). Holmes : Jeremy Brett. Watson : David Burke. 2009 : The Resident Patient. Holmes : John Patrick Lowrie. Watson : Lawrence Albert. 1992 : The Resident Patient. Holmes : Clive Merrison. Watson : Michael Williams. 1961 : The Resident Patient. Holmes : Carleton Hobbs. Watson : Norman Shelley. 1941 : The Resident Patient (The Chess Club Murders). Holmes : Basil Rathbone. Watson : Nigel Bruce. 1936 : The Resident Patient. Holmes : Louis Hector. Watson : Harry West. 1931 : The Resident Patient. Holmes : Richard Gordon. Watson : Leigh Lovell. 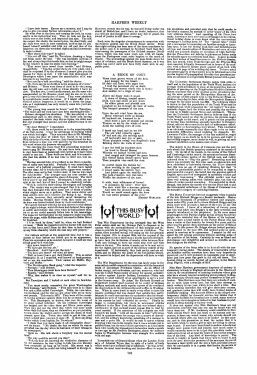 In glancing over the somewhat incoherent series of memoirs with which I have endeavoured to illustrate a few of the mental peculiarities of my friend, Mr Sherlock Holmes, I have been struck by the difficulty which I have experienced in picking out examples which shall in every way answer my purpose. 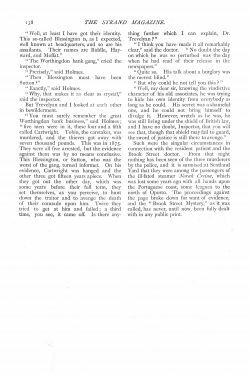 For in those cases in which Holmes has performed some tour-de-force of analytical reasoning, and has demonstrated the value of his peculiar methods of investigation, the facts themselves have often been so slight or so commonplace that I could not feel justified in laying them before the public. 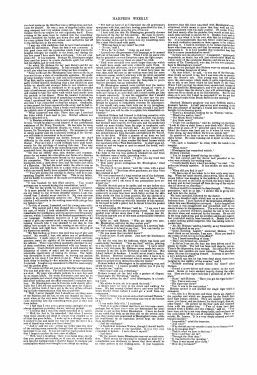 On the other hand, it has frequently happened that he has been concerned in some research where the facts have been of the most remarkable and dramatic character, but where the share which he has himself taken in determining their causes has been less pronounced than I, as his biographer, could wish. The small matter which I have chronicled under the heading of 'A Study in Scarlet,' and that other later one connected with the loss of the Gloria Scott, may serve as examples of this Scylla and Charybdis which are for ever threatening his historian. It may be that, in the business of which I am now about to write, the part which my friend played is not sufficiently accentuated; and yet the whole train of circumstances is so remarkable that I cannot bring myself to omit it entirely from this series. 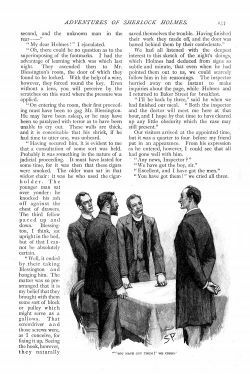 I cannot be sure of the exact date, for some of my memoranda upon the matter have been mislaid, but it must have been towards the end of the first year during which Holmes and I shared chambers in Baker Street. It was boisterous October weather, and we had both remained indoors all day, I because I feared with my shaken health to face the keen autumn wind, while he was deep in some of those abstruse chemical investigations which absorbed him utterly as long as he was engaged upon them. Towards evening, however, the breaking of a test-tube brought his research to a premature ending, and he sprang up from his chair with an exclamation of impatience and a clouded brow. I was weary of our little sitting-room, and gladly acquiesced, muffling myself nose-high against the keen night air. For three hours we strolled about together, watching the ever-changing kaleidoscope of life as it ebbs and flows through Fleet Street and the Strand. 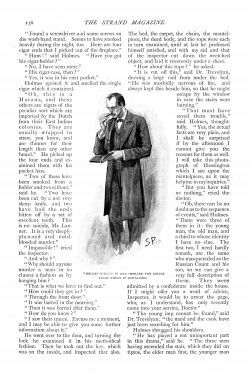 Holmes had shaken off his temporary ill-humour, and his characteristic talk, with its keen observance of detail and subtle power of inference, held me amused and enthralled. It was ten o'clock before we reached Baker Street again. A brougham was waiting at our door. 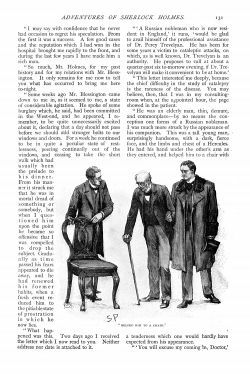 I was sufficiently conversant with Holmes's methods to be able to follow his reasoning, and to see that the nature and state of the various medical instruments in the wicker basket which hung in the lamp-light inside the brougham had given him the data for his swift deduction. The light in our window above showed that this late visit was indeed intended for us. With some curiosity as to what could have sent a brother medico to us at such an hour, I followed Holmes into our sanctum. A pale, taper-faced man with sandy whiskers rose up from a chair by the fire as we entered. His age may not have been more than three or four and thirty, but his haggard expression and unhealthy hue told of a life which had sapped his strength and robbed him of his youth. His manner was nervous and shy, like that of a sensitive gentleman, and the thin white hand which he laid on the mantelpiece as he rose was that of an artist rather than of a surgeon. His dress was quiet and sombre, a black frock-coat, dark trousers, and a touch of colour about his necktie. 'Are you not the author of a monograph upon obscure nervous lesions?' I asked. 'One or two of them are so trivial,' said Dr Trevelyan, 'that really I am almost ashamed to mention them. But the matter is so inexplicable, and the recent turn which it has taken is so elaborate, that I shall lay it all before you, and you shall judge what is essential and what is not. 'I am compelled, to begin with, to say something of my own college career. I am a London University man, you know, and I am sure you will not think that I am unduly singing my own praises if I say that my student career was considered by my professors to be a very promising one. After I had graduated I continued to devote myself to research, occupying a minor position in King's College Hospital, and I was fortunate enough to excite considerable interest by my research into the pathology of catalepsy, and finally to win the Bruce Pinkerton prize and medal by the monograph on nervous lesions to which your friend has just alluded. I should not go too far if I were to say that there was a general impression at that time that a distinguished career lay before me. 'But the one great stumbling-block lay in my want of capital. As you will readily understand, a specialist who aims high is compelled to start in one of a dozen streets in the Cavendish Square quarter, all of which entail enormous rents and furnishing expenses. Besides this preliminary outlay, he must be prepared to keep himself for some years, and to hire a presentable carriage and horse. To do this was quite beyond my power, and I could only hope that by economy I might in ten years' time save enough to enable me to put up my plate. Suddenly, however, an unexpected incident opened up quite a new prospect to me. 'This was a visit from a gentleman of the name of Blessington, who was a complete stranger to me. He came up into my room one morning, and plunged into business in an instant. 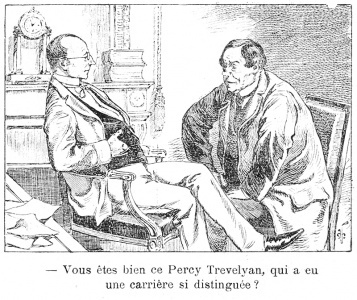 '"You are the same Percy Trevelyan who has had so distinguished a career and won a great prize lately?' said he. I bowed. '"Answer me frankly," he continued, "for you will find it to your interest to do so. You have all the cleverness which makes a successful man. Have you the tact?" 'I could not help smiling at the abruptness of the question. '"I trust that I have my share," I said. '"Any bad habits? Not drawn towards drink, eh?" '"Quite right! That's all right! But I was bound to ask. With all these qualities why are you not in practice?" '"Come, come!" said he, in his bustling way. "It's the old story. More in your brains than in your pocket, eh? What would you say if I were to start you in Brook Street?" 'I stared at him in astonishment. '"Oh, it's for my sake, not for yours," he cried. "I'll be perfectly frank with you, and if it suits you it will suit me very well. I have a few thousands to invest, d'ye see, and I think I'll sink them in you." '"Well, it's just like any other speculation, and safer than most." '"What am I to do, then?" '"I'll tell you. I'll take the house, furnish it, pay the maids, and run the whole place. All you have to do is just to wear out your chair in the consulting-room. I'll let you have pocket-money and everything. Then you hand over to me three-quarters of what you earn and you keep the other quarter for yourself." 'This was the strange proposal, Mr Holmes, with which the man Blessington approached me. I won't weary you with the account of how we bargained and negotiated. It ended in my moving into the house next Lady Day and starting in practice on very much the same conditions as he had suggested. He came himself to live 'with me in the character of a resident patient. His heart was weak, it appears, and he needed constant medical supervision. He turned the two best rooms on the first floor into a sitting-room and bedroom for himself. He was a man of singular habits, shunning company and very seldom going out. His life was irregular, but in one respect he was regularity itself. Every evening at the same hour he walked into the consulting-room, examined the books, put down five and threepence for every guinea that I had earned, and carried the rest off to the strong box in his own room. 'I may say with confidence that he never had occasion to regret his speculation. From the first it was a success. A few good cases and the reputation which I had won in the hospital brought me rapidly to the front, and during the last few years I have made him a rich man. 'So much, Mr Holmes, for my past history and for my relations with Mr Blessington. It only remains for me now to tell you what has occurred to bring me here to-night. 'Some weeks ago Mr Blessington came down to me in, as it seemed to me, a state of considerable agitation. He spoke of some burglary which, he said, had been committed in the West-end, and he appeared, I remember, to be quite unnecessarily excited about it, declaring that a day should not pass before we should add stronger bolts to our windows and doors. For a week he continued to be in quite a peculiar state of restlessness, peering continually out of the windows, and ceasing to take the short walk which had usually been the prelude to his dinner. From his manner it struck me that he was in mortal dread of something or somebody, but when I questioned him upon the point he became so offensive that I was compelled to drop the subject. Gradually as time passed his fears appeared to die away, and he had renewed his former habits, when a fresh event reduced him to the pitiable state of prostration in which he now lies. 'What happened was this. Two days ago I received the letter which I now read to you. Neither address nor date is attached to it. '"A Russian nobleman who is now resident in England," it runs, "would be glad to avail himself of the professional assistance of Dr Percy Trevelyan. 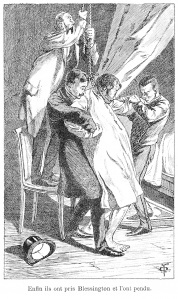 He has been for some years a victim to cataleptic attacks, on which, as is well known, Dr Trevelyan is an authority. He proposes to call at about a quarter-past six tomorrow evening, if Dr Trevelyan will make it convenient to be at home." 'This letter interested me deeply, because the chief difficulty in the study of catalepsy is the rareness of the disease. You may believe, then, that I was in my consulting-room when, at the appointed hour, the page showed in the patient. 'He was an elderly man, thin, demure, and commonplace-by no means the conception one forms of a Russian nobleman. I was much more struck by the appearance of his companion. This was a tall young man, surprisingly handsome, with a dark, fierce face, and the limbs and chest of a Hercules. He had his hand under the other's arm as they entered, and helped him to a chair with a tenderness which one would hardly have expected from his appearance. 'I was touched by this filial anxiety. "You would, perhaps, care to remain during the consultation," said I. 'To this, of course, I assented, and the young man withdrew. The patient and I then plunged into a discussion of his case, of which I took exhaustive notes. He was not remarkable for intelligence, and his answers were frequently obscure, which I attributed to his limited acquaintance with our language. Suddenly, however, as I sat writing he ceased to give any answer at all to my inquiries, and on my turning towards him I was shocked to see that he was sitting bolt upright in his chair, staring at me with a perfectly blank and rigid face. He was again in the grip of his mysterious malady. 'My first feeling, as I have just said, was one of pity and horror. My second, I fear, was rather one of professional satisfaction. I made notes of my patient's pulse and temperature, tested the rigidity of his muscles, and examined his reflexes. There was nothing markedly abnormal in any of these conditions, which harmonized with my former experiences. I had obtained good results in such cases by the inhalation of nitrite of amyl, and the present seemed an admirable opportunity of testing its virtues. The bottle was downstairs in my laboratory, so, leaving my patient seated in his chair, I ran down to get it. There was some little delay in finding it - five minutes, let us say - and then I returned. Imagine my amazement to find the room empty and the patient gone! 'Of course, my first act was to run into the waiting-room. The son had gone also. The hall door had been closed, but not shut. My page who admits patients is a new boy, and by no means quick. He waits downstairs, and runs up to show patients out when I ring the consulting-room bell. He had heard nothing, and the affair remained a complete mystery. 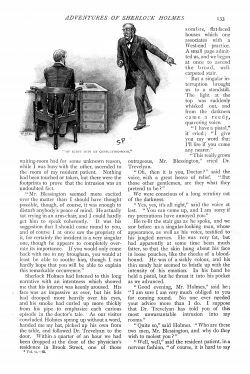 Mr Blessington came in from his walk shortly afterwards, but I did not say anything to him upon the subject, for, to tell the truth, I have got in the way of late of holding as little communication with him as possible. 'Well, I, never thought that I should see anything more of the Russian and his son, so you can imagine my amazement when at the very same hour this evening they both came marching into my consulting-room, just as they had done before. '"I feel that I owe you a great many apologies for my abrupt departure yesterday, Doctor," said my patient. '"I confess that I was very much surprised at it," said I. '"Well, the fact is," he remarked, "that when I recover from these attacks my mind is always very clouded as to all that has gone before. I woke up in a strange room, as it seemed to me, and made my way out into the street in a sort of dazed way when you were absent. '"And I," said the son, "seeing my father pass the door of the waiting-room, naturally thought that the consultation had come to an end. It was not until we had reached home that I began to realize the true state of affairs." 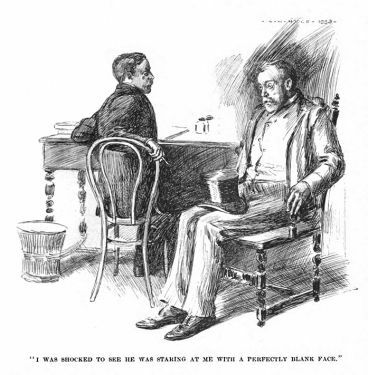 '"Well," said I, laughing, "there is no harm done, except that you puzzled me terribly; so if you, sir, would kindly step into the waiting-room, I shall be happy to continue our consultation, which was brought to so abrupt an ending." 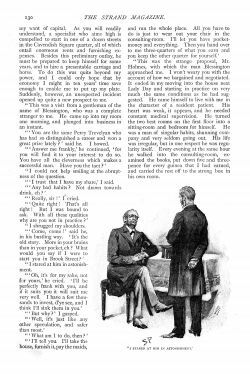 'For half an hour or so I discussed the old gentleman's symptoms with him, and then, having prescribed for him, I saw him go off on the arm of his son. 'I have told you that Mr Blessington generally chose this hour of the day for his exercise. He came in shortly afterwards and passed upstairs. An instant later I heard him running down, and he burst into my consulting-room like a man who is mad with panic. '"Who has been in my room?" he cried. '"It's a lie!" he yelled. "Come up and look." 'I passed over the grossness of his language, as he seemed half out of his mind with fear. When I went upstairs with him he pointed to several footprints upon the light carpet. '"D'you mean to say those are mine?" he cried. 'They were certainly very much larger than any which he could have made, and were evidently quite fresh. It rained hard this afternoon, as you know, and my patients were the only people who called. 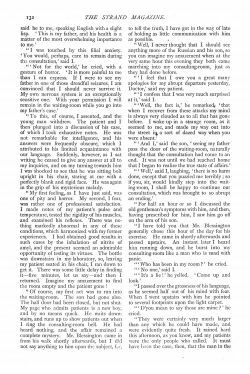 It must have been the case, then, that the man in the waiting-room had for some unknown reason, while I was busy with the other, ascended to the room of my resident patient. Nothing had been touched or taken, but there were the footprints to prove that the intrusion was an undoubted fact. 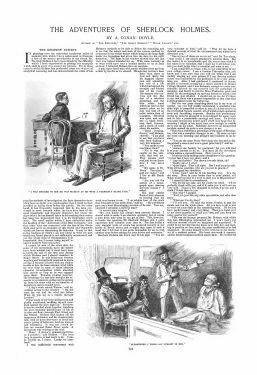 Sherlock Holmes had listened to this long narrative with an intentness which showed me that his interest was keenly aroused. His face was as impassive as ever, but his lids had drooped more heavily over his eyes, and his smoke had curled up more thickly from his pipe to emphasize each curious episode in the doctor's tale. As our visitor concluded Holmes sprang up without a word, handed me my hat, picked up his own from the table, and followed Dr Trevelyan to the door. Within a quarter of an hour we had been dropped at the door of the physician's residence in Brook Street, one of those sombre, flat-faced houses which one associates with a West-end practice. A small page admitted us, and we began at once to ascend the broad, well-carpeted stair. But a singular interruption brought us to a standstill. The light at the top was suddenly whisked out, and from the darkness came a reedy, quavering voice. 'This really grows outrageous, Mr Blessington,' cried Dr Trevelyan. He re-lit the stair gas as he spoke, and we saw before us a singular-looking man, whose appearance, as well as his voice, testified to his jangled nerves. He was very fat, but had apparently at some time been much fatter, so that the skin hung about his face in loose pouches, like the cheeks of a blood-hound. He was of a sickly colour, and his thin sandy hair seemed to bristle up with the intensity of his emotion. In his hand he held a pistol, but he thrust it into his pocket as we advanced. He led the way into his bedroom, which was large and comfortably furnished. 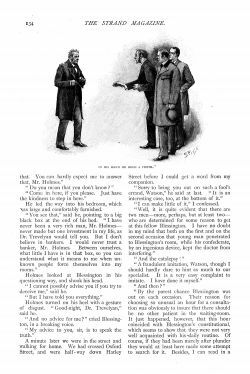 Holmes looked at Blessington in his questioning way, and shook his head. 'I cannot possibly advise you if you try to deceive me,' said he. 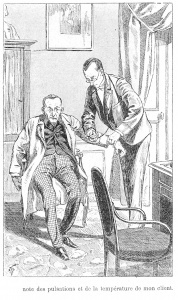 Holmes turned on his heel with a gesture of disgust. 'Good-night, Dr Trevelyan,' said he. 'And no advice for me?' cried Blessington, in a breaking voice. A minute later we' were in the street and walking for home. We had crossed Oxford Street, and were half-way down Harley Street before I could get a word from my companion. 'I can make little of it,' I confessed. I saw in the gaslight that Holmes wore an amused smile at this brilliant departure of mine. Sherlock Holmes's prophecy was soon fulfilled, and in a dramatic fashion. At half-past seven next morning, in the first dim glimmer of daylight, I found him standing by my bedside in his dressing-gown. 'There's a brougham waiting for us, Watson,' said he. In a quarter of an hour or so we were back at the physician's house. He came running out to meet us with a face of horror. 'Oh, such a business!' he cried, with his hands to his temples. We had entered, and the doctor had preceded us into what was evidently his waiting-room. 'With your permission,' said he at last, 'I should like to go upstairs and look into the matter.' We both ascended, followed by the doctor. It was a dreadful sight which met us as we entered the bedroom door. I have spoken of the impression of flabbiness which this man Blessington conveyed. As he dangled from the hook it was exaggerated and intensified until he was scarce human in his appearance. The neck was drawn out like a plucked chicken's, making the rest of him seem the more obese and unnatural by the contrast. 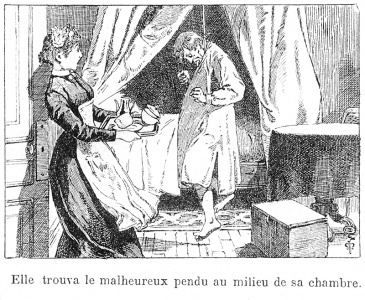 He was clad only in his long night-dress, and his swollen ankles and ungainly feet protruded starkly from beneath it. Beside him stood a smart-looking police inspector, who was taking notes in a pocket-book. 'I should say that he has been dead about three hours, judging by the rigidity of the muscles,' said I. 'Noticed anything peculiar about the room?' asked Holmes. 'Oh, this is a Havana, and these others are cigars of the peculiar sort which are imported by the Dutch from their East Indian colonies. They are usually wrapped in straw, you know, and are thinner for their length than any other brand.' He picked up the four ends and examined them with his pocket lens. He went over to the door, and turning the lock he examined it in his methodical fashion. Then he took out the key, which was on the inside, and inspected that also. The bed, the carpet, the chairs, the mantelpiece, the dead body, and the rope were each in turn examined, until at last he professed himself satisfied, and with my aid and that of the inspector cut down the wretched object, and laid it reverently under a sheet. 'How about this rope?' he asked. 'But you have told us nothing,' cried the doctor. 'My dear Holmes!' I ejaculated. 'Oh, there could be no question as to the superimposing of the footmarks. I had the advantage of learning which was which last night. They ascended then to Mr Blessington's room, the door of which they found to be locked. With the help of a wire, however, they forced round the key. Even without a lens, you will perceive by the scratches on this ward where the pressure was applied. 'On entering the room, their first proceeding must have been to gag Mr Blessington. He may have been asleep, or he may have been so paralysed with terror as to have been unable to cry out. These walls are thick, and it is conceivable that his shriek, if he had time to utter one, was unheard. 'Having secured him, it is evident to me that a consultation of some sort was held. Probably it was something in the nature of a judicial proceeding. It must have lasted for some time, for it was then that these cigars were smoked. The older man sat in that wicker chair: it was he who used the cigar-holder. The younger man sat over yonder: he knocked his ash off against the chest of drawers. The third fellow paced up and down. Blessington, I think, sat upright in the bed, but of that I cannot be absolutely certain. We had all listened with the deepest interest to this sketch of the night's doings, which Holmes had deduced from signs so subtle and minute, that even when he had pointed them out to us, we could scarcely follow him in his reasonings. 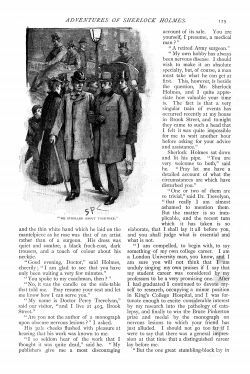 The inspector hurried away on the instant to make inquiries about the page, while Holmes and I returned to Baker Street for breakfast. Our visitors arrived at the appointed time, but it was a quarter to four before my friend put in an appearance. From his expression as he entered, however, I could see that all had gone well with him. 'You have got them!' we cried all three. 'The Worthingdon bank gang,' cried the inspector. 'Why, that makes it as clear as crystal,' said the inspector. Such were the singular circumstances in connection with the resident patient and the Brook Street doctor. From that night nothing has been seen of the three murderers by the police, and it is surmised at Scotland Yard that they were among the passengers of the ill-fated steamer Norah Creina, which was lost some years ago with all hands upon the Portuguese coast, some leagues to the north of Oporto. The proceedings against the page broke down for want of evidence, and the 'Brook Street Mystery,' as it was called, has never, until now, been fully dealt with in any public print. This page was last edited on 28 March 2019, at 18:00.